The Earned Income Tax Credit is one of the most effective anti-poverty programs in the nation according to the Center for Budget and Policy Priorities. It reduces the taxes that our lowest income workers pay, allowing these workers to keep more of their income. It particularly helps women and children with families, as these groups are disproportionately affected by poverty. President Obama, during the State of the Union, called to strengthen the EITC at the federal level. Montgomery County is one of only a few local governments in the country that has its own Earned Income Tax Credit (EITC), which we call our Working Families Income Supplement. Last year, I sponsored Bill 8-13, Working Families Income Supplement, which restores by law Montgomery County’s 100% match to the state’s EITC over 3 years. Traditionally, Montgomery County matched the State of Maryland’s EITC, to ensure that our low-income residents could deal with our high cost of living. In other words, if a taxpayer received $500 from the Maryland EITC, she would receive $500 from Montgomery County as well. However, during the Great Recession, the County Council cut the county’s EITC by about a third. After working to restore it gradually through the budget process, I authored and passed a bill to fully restore the EITC as a matter of law. Citizens for Tax Justice released an analysis of the Montgomery County EITC, which it calls an “exemplary” policy, and notes the following benefits of the EITC. It improves infant health. Families that have more resources have healthier children, and in Montgomery County we care about getting our children off to the best start in order to help them achieve their potential. For infants, health problems can compound over time. The EITC helps address this need. It boosts school achievement. Montgomery County is committed to helping young people achieve regardless of their circumstances. The responsibility to help every child succeed is not just born by our great school system, but the county government has important responsibilities to improve the conditions at home. The EITC is proven to boost educational outcomes and close the achievement gap. It is proven to reduce poverty. The EITC just puts food on the table. Funds that come from the EITC may keep a family from falling into the tragic spiral that can happen when a car payment is missed or a rent payment is missed. My EITC bill passed the Montgomery County Council unanimously on Oct. 29, 2013, but my work on the EITC and anti-poverty programs does not end there. It is important to share with our most vulnerable neighbors that the EITC and other tax credits exist to help them. After all, taxpayers must claim the tax refund in order to benefit from it. About 20% of eligible taxpayers do not claim it nationally, presumably because they are not aware. 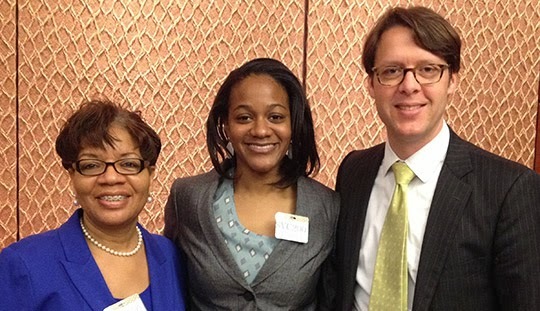 For EITC Awareness Day, the National Community Tax Coalition asked me to speak on Capitol Hill. I was joined by fellow Montgomery County residents Camille Henry, former EITC recipient and current EITC advocate, as well as Pam Luckett from Montgomery County Community Action Agency Board. Panelists spoke on how the EITC expands opportunity for women, how it is a vital support for women and children, and the free tax programs available to low income households. The spectrum of event sponsors is a testament to the broad based effectiveness of the EITC. Sponsors were Center on Budget and Policy Priorities, the National Women’s Law Center, the Community Action Partnership, the National Immigration Law Center, the National Disability Institute, Wider Opportunity for Women, RESULTS, CLASP, Doorways to Dreams, Goodwill, Half in Ten, the United Way, the National Council of La Raza, the Coalition on Human Needs and Tax Credits for Working Families. With these well researched benefits and a formula that targets our friends and neighbors in the greatest need, I know that our County will be better off. Please check out information on free income tax assistance(below) sent to me by Montgomery County’s Community Action Agency. The Volunteer Income Tax Assistance Program (VITA) is for families earning less than $52,000 a year. Tax Counseling for the Elderly (TCE) offers free tax help and free electronic filing for people 60+. There are sites and partnerships are throughout Montgomery County, now through April 15. Trained, IRS-certified volunteers help customers access any available credits they may be eligible for, such as the Earned Income Tax Credit, Child Tax Credit, and Credit for the Elderly or the Disabled, etc. Community Action Agency VITA Partnership (CAA), by APPOINTMENT ONLY: appointments may be made online for sites in Gaithersburg (Family Services Inc.), Wheaton (Regional Services Center), Rockville (City of Rockville), Takoma Park (TESS) and College Park (U of MD) at www.montgomerycountymd.gov/freetaxhelp and may be cancelled or re-scheduled online (see attached flyers). Or call 240-777.1123 (main) or 240.314.8310 (City of Rockville). Appointments for back year and amended returns: June- October only. Wheaton Library’s VITA, WALK IN ONLY: 11701 Georgia Avenue, Feb. 6 – April, hours: 3:30 – 8:30 PM. No service on March 20th. Community Tax Aid VITA, WALK-IN ONLY: Feb. 1 – April 13. Park Montgomery Apts. Community Center, 8860 Piney Branch Road, Silver Spring, 20903. Sundays: 1 PM – 4 PM. CTA – Rockville Library, 21 Maryland Avenue, 20850. Saturdays, noon – 3 PM. Additional sites in the Metro area: www.communitytaxaiddc.org/ 202.547.7773. Note Income limits: $35,000 for individuals; $52,000 for families. Chinese Culture and Community Service Center VITA, 9366 Gaither Road, Gaithersburg, 20877. For more info, call: 301.820.7200. Ana G. Mendez University VITA, by APPOINTMENT ONLY: 11006 Veirs Mill Road, L-1, Silver Spring, 20901. Wednesdays, 6 PM – 9 PM, Saturdays, 1 – 5 PM. Call: 202.486.2214. IRS local offices NO LONGER prepares taxes, but accepts documents for ITINS (Individual Tax ID Number). See IRS website, or IRS Taxpayer Assistance Office: 11510 Georgia Ave. Wheaton, MD 240.613.8976. VITA/TCE sites can prepare taxes for people who already have ITINs; CAA has a certified acceptance agent who may review documents for “new” ITIN filers while people are having taxes prepared. Sign Language Interpretation: CAA provides interpretation with advance notice, or contact Gallaudet University VITA in DC: 202.250.2375.
www.mdcash.org/free-tax-preparation/ MD residents outside Montgomery: Call “211” MD RELAY “711”.